The South West has a new crematorium, complete with a webcasting facility that gives family or friends who are unable to attend a funeral the opportunity to view the service. The East Devon Crematorium, located just off the old A30 at Strete Ralegh near Whimple in Devon, opened on 13 April to serve the growing population of East Devon and West Dorset. It will cater for an area stretching from Exmouth to Bridport, reducing travel times for bereaved relatives and relieving the pressure on crematoria in Exeter, Taunton, Yeovil and Weymouth. The £4m privately funded development comprises a modern building with a single chapel and a Book of Remembrance room. The building is in a secluded position, set back from the main road in 10 acres of memorial gardens, backed by mature woodland. It is non-denominational and accommodates all faiths as well as non-religious services. Service times will be 45 minutes, compared with a standard 30 to 40 minutes elsewhere, giving families more time to gather and leave without the pressure of other funerals waiting for access. The Chapel, which seats up to 90 people, is among the first in the UK to offer a webcasting facility that enables a funeral to be viewed via a secure internet link. For large funerals, speakers fitted in the foyer and the covered entrance area of the East Devon Crematorium enable a service to be broadcast to up to 200 people. An internet-based music system allows any piece of music in the world to be played, while a more traditional church organ, with organist, is also available. The new facility is privately owned and operated by East Devon Crematorium Ltd, which was formed by Cornwall-based Chris Johns, a past president of the Institute of Cemetery and Crematorium Management (ICCM) and a former director of Memoria, a company that built five crematoria across Britain from 2004. 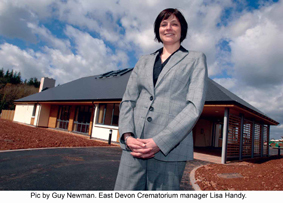 Until 2003, Chris was also director of crematoria at Dignity plc, with responsibility for running Exeter Crematorium. His business partners are investors; chairman Jeremy Sharman, finance director Steve Sheridan and The Southern Co-operative, one of the independent regional Co-op societies. “We have worked closely with local funeral directors to ensure that the facility is exactly what is needed in this area,” said Chris. “In the design, we have been sensitive to the rural nature of the area and have worked with the existing woodland, aiming to complement it with our planting of hundreds of indigenous, broadleaf trees in the memorial garden. The new crematorium manager is Lisa Handy, who was formerly the bereavement services manager at Leicester City Council. She said: “Although this is a new facility, the management team here has 50 years’ experience in delivering professional and caring services at crematoria across the UK. East Devon Crematorium Ltd is a member of Burial and Cremation Education Trust (BCET) Carbon Footprint Scheme and is committed to making every effort to reduce any environmental impact. Memorial products used are sourced from low carbon providers and sustainable, native materials are used wherever possible. As a brand new facility and in response to the national increase in average body weight, East Devon Crematorium is equipped to deal with large coffins. Standard coffins range from 40cm wide but the new cremator at East Devon Crematorium is able to accommodate coffins of just over one metre wide. The Bishop of Exeter, the Right Revd Michael Langrish will lead a dedication ceremony on Wednesday June 15th at 3pm.